Babbling Brooke: Ugly Sweater Party Nails!! Last night I went to an ugly sweater party - the kind where you dress up in those over-the-top pom-pom embellished, twinkling lights sweaters that every mom I knew wore when I was in elementary school. These parties have become pretty popular in the last few years, especially for college students (and since I'm in grad school, I can pretend I'm young enough to partake in these events still). All you need is an ugly sweater, but green pants, tights, a silly hat or earrings, etc., all make the outfit so much better. I won't show you my outfit - it is just too hideously embarrassing to post, but here are my fabulously disastrous ugly sweater nails. Please, revel in the ugliness of it all. I used the argyle stamp since what is better than an argyle Christmas sweater? *For the base, I used Nicole Really, Really Red and for my Konad design, I used my white polish and plate m60. *I then topped that with a stripe of Zoya Veruschka (with top coat) and then a stripe of Sally Hansen White Gold Chrome polish. *For the bows (what ugly Christmas sweater is complete without bows? ), I used Konad plate m3 and Maybelline Merlot Magic. I topped it all with Seche Vite and I've been debating about adding glitter, just to make it that much more over the top. with a cameo by SNOW! (and lots of it too). It is snowing like crazy outside! 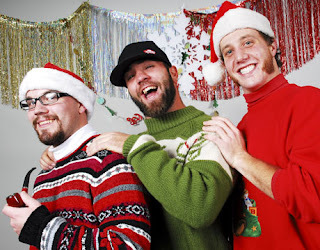 Want to read more about ugly sweater parties? This is a pretty hilarious take on the little phenomena. This blog post is dedicated to my FAVORITE bank teller ever. She is just the sweetest lady with the most fabulous nails. When I stopped by the bank yesterday afternoon (totally embarrassed by my crazy nails), she was telling me how wonderful and Christmasy they are - I couldn't bring myself to tell her that they were totally ironic. She's always so nice and we have the best conversations about nails. Then I stopped by the grocery store and remembered why I hate going shopping around the holidays. People. Frantic, stressed, pretend-cheerful people. And maniac drivers. Ugh. Are any of you going to any fun holiday parties this weekend? These nails are awesome; I love the idea behind it! Haha, thanks Liz :) I'll think about it... not sure if I'm ready to publicly post that kind of humiliation yet - I even debated about posting these crazy nails! Hope you're enjoying all the snow! Thanks gildedangel! They are pretty crazy... lol. are you doing all those designs without any help? i can't even paint my nails in the right way after so many years1 well done! Your nails look like the cutest little ugly sweaters!